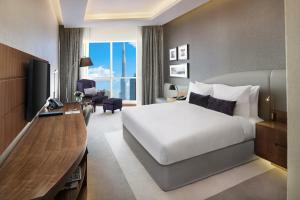 Radisson Blu Hotel boasts a prime location adjacent to the near by Dubai Canal in Business Bay. There is an outdoor pool and a fitness centre at the property. Guests can enjoy free WiFi throughout the property. The property offers a wide range of outlets, total 8 bars and restaurants, including Fire Lake Cocktail Bar and Grill, Larder, Makar Scottish bar, Gotha Club, NYC Loft style bar. 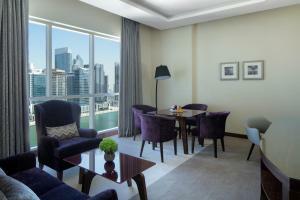 Guests can enjoy the pool and terrace over-looking the Dubai Canal, kid's pool & club, spa, gym, salons and gift shops. 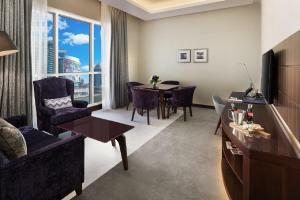 Radisson Blu Hotel is within close proximity of Dubai International Financial Center, Dubai World Trade Center and only 15 kilometers from Dubai International Airport. Free car park is available at the hotel. 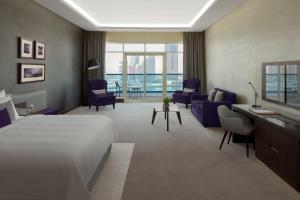 Please note that there is an additional 20 AED tourism fee per room per unit per night payable at the hotel directly. Guests are required to show a photo identification and credit card upon check-in. Please note that all Special Requests are subject to availability and additional charges may apply. This air-conditioned room offers free high-speed WiFi, a seating area with a flat-screen TV, a mini bar, safe box and coffee and tea facilities. The bathroom is fitted with a magnifying mirror, a hairdryer and a shower. 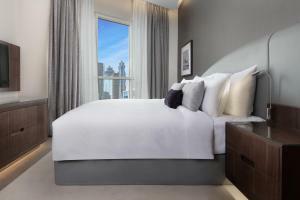 Guests can choose between double or twin beds and can enjoy complimentary access to the fitness center and pool. This spacious, air-conditioned Superior Room offers a balcony, free high-speed WiFi and a seating area with a flat-screen TV, a mini bar, safe box and coffee and tea facilities. The bathroom is fitted with a magnifying mirror, a hairdryer and a shower. 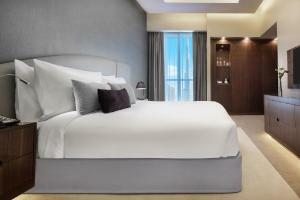 Guests can choose between double or twin beds and can enjoy complimentary access to the fitness center and pool. 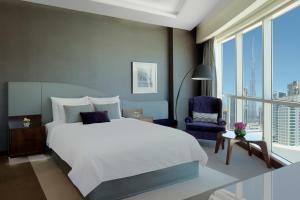 For an extended stay or for extra space, choose one of the hotels Suites. 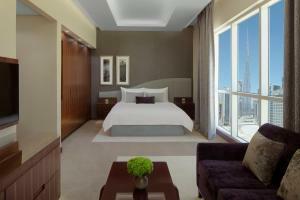 These spacious surroundings include a living area separate from the bedroom for ultimate comfort and privacy. The Suites also offer a free deep sleep pillow spray and turndown service every evening so you can enjoy a good night’s sleep. 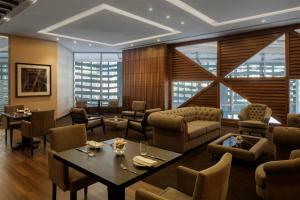 Sit back and relax in the Business Class Lounge where snacks and refreshments are waiting for you. This double room features, two flat-screen televisions and free WiFi, so everyone can relax with their preferred entertainment, bathrobe, soundproofing and air conditioning. PLEASE ENJOY: Complimentary Breakfast Free High-Speed Wireless Internet Access to Business Class Lounge where you enjoy Breakfast & happy hours Bathrobe and slippers Mini bar Nespresso® coffee machine Complimentary access to fitness center and pool Safe box. 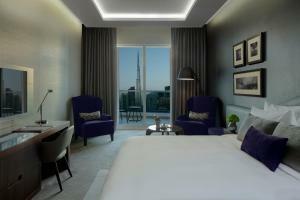 The Premium Rooms are located on the higher floors. 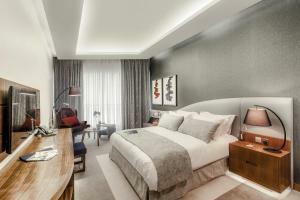 They include the same amenities as the Superior Rooms, while also offering the in-room Espresso machine. 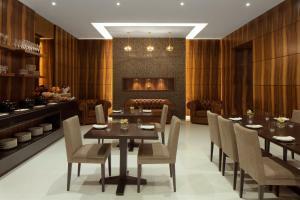 In addition you get access to the exclusive Business Class Lounge where snacks and refreshments are waiting for you. This double room features, Balcony, one flat-screen televisions and free WiFi, bathrobe, soundproofing and air conditioning. 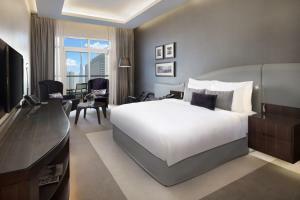 This room offers: Complimentary Breakfast Free High-Speed Wireless Internet Bathrobe and slippers Mini bar Nespresso® coffee machine Access to Business Class Lounge where you can enjoy Breakfast & happy hours Complimentary access to fitness center and pool Safe box. Tailored for families who want to stay together, these spacious Family Rooms feature a king size bed and a comfortable sofa-bed in a separate area. 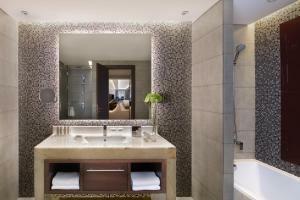 Enjoy a well-equipped bathroom with a separate shower and bathtub. The room also includes free WiFi, so everyone can relax with their preferred entertainment. This double room features a balcony, flat-screen TV, bathrobe, soundproofing and air conditioning. This room offers: Free High-Speed, Wireless Internet, Mini bar Coffee & tea provisions Complimentary access to fitness center and pool Safe box. 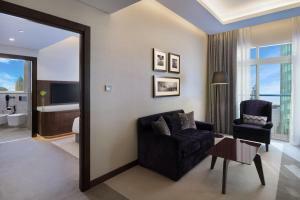 These suites feature separate sleeping and living areas. 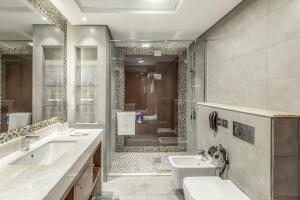 With a well-equipped bathroom with a rain shower, bathrobe and slippers, the Junior Suites let you to unwind and enjoy your stay. Enjoy exclusive access to the exclusive Business Class Lounge where snacks and refreshments are waiting for you. This double room features, two flat-screen televisions and free WiFi, so everyone can relax with their preferred entertainment, bathrobe, soundproofing and air conditioning. 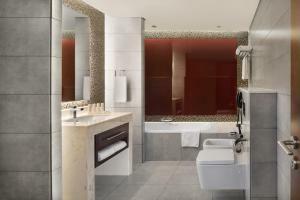 This room offers: Complimentary Breakfast Free High-Speed, Wireless Internet Access to Business Class Lounge where you enjoy Breakfast & happy hours Bathrobe and slippers Mini bar Nespresso® coffee machine Complimentary access to fitness center and pool Safe box.